as a performance enhancer: 500mg-1000mg taken twice daily, usually taken before training. as a nootropic: 500mg taken in the morning. A second daily dosage can be added if well tolerated, but it is advised not to take a dosage within 8 hours of your planned bedtime. These are guidelines only. Your doctor will be able to advise you of a suitable dosage for your requirements. Side effects that may occur include increased blood pressure, tachycardia (high heart rate) and indigestion. If you notice any side effects while taking Meldonium, contact your doctor. If you have an allergic reaction to meldonium, stop taking it and contact your doctor immediately. The World Anti-Doping Agency (WADA) announced in 2015 that Meldonium would a banned substance from January 1st, 2016. Several athletes (most notably Maria Sharapova) have already tested positive for meldonium since this banning. Do not use meldonium if you participate in a sport where you will be tested for drug use. It is not recommended that pregnant or breastfeeding women take meldonium as safety data has yet to be established. 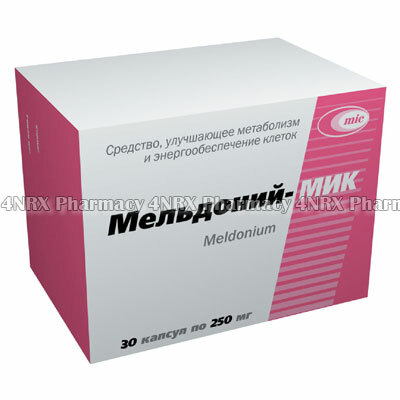 Kidney or liver problems can lead to complications as Meldonium is excreted renally. Some hypotensive drugs can have their antianginal effect increased by meldonium.